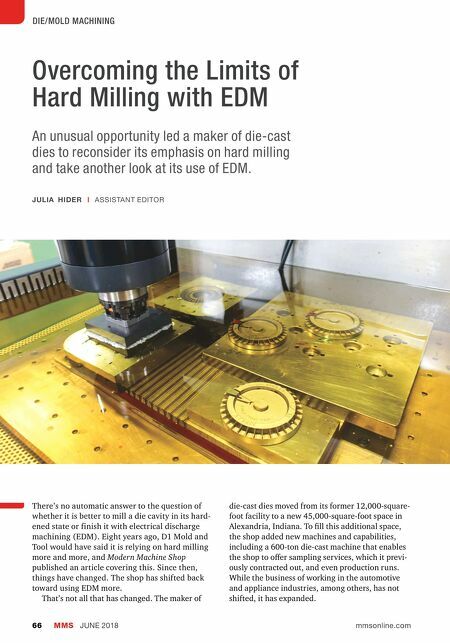 MMS JUNE 2018 66 mmsonline.com DIE/MOLD MACHINING Overcoming the Limits of Hard Milling with EDM An unusual opportunity led a maker of die-cast dies to reconsider its emphasis on hard milling and take another look at its use of EDM. There's no automatic answer to the question of whether it is better to mill a die cavity in its hard- ened state or finish it with electrical discharge machining (EDM). 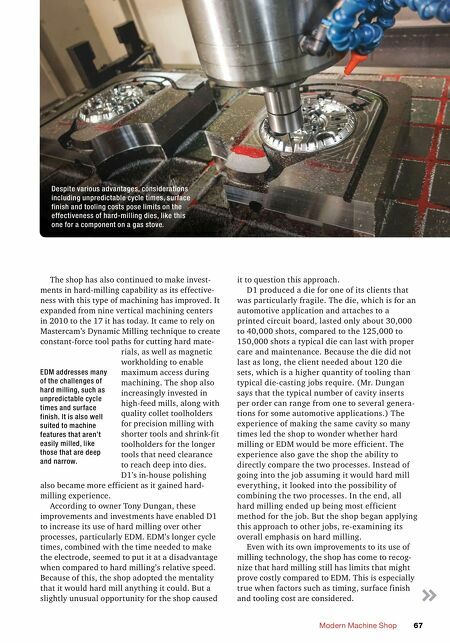 Eight years ago, D1 Mold and Tool would have said it is relying on hard milling more and more, and Modern Machine Shop published an article covering this. Since then, things have changed. The shop has shifted back toward using EDM more. That's not all that has changed. The maker of JULIA HIDER | ASSISTANT EDITOR die-cast dies moved from its former 12,000-square- foot facility to a new 45,000-square-foot space in Alexandria, Indiana. To fill this additional space, the shop added new machines and capabilities, including a 600-ton die-cast machine that enables the shop to offer sampling services, which it previ- ously contracted out, and even production runs. While the business of working in the automotive and appliance industries, among others, has not shifted, it has expanded.